Can I get antibiotic treatment online? Most ear infections do not require antibiotic treatment. Many are viral and will not respond to antibiotics. 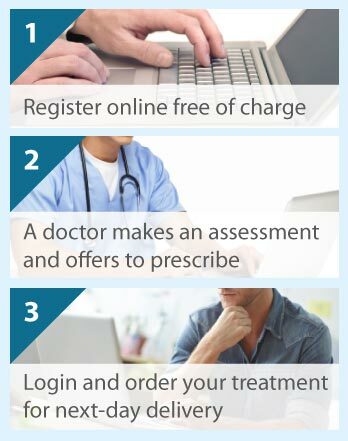 Where antibiotics are justified, we can prescribe online for next day delivery. Click on the free assessment button to start. Ear infections (otitis) are common and can occur in both ears, although mostly only one ear is affected. Infections may develop in any one of the three parts of the ear. They usually occur in either the outer ear (the ear canal) or middle ear (the air-filled space behind the eardrum), rather than the inner ear (the labyrinth). Outer ear infections generally give rise to symptoms such as itching, discharge, pain (earache), slight loss of hearing, and a blocked feeling. Middle ear symptoms include earache, fever, nausea, vomiting, slight loss of hearing, and discharge (if the eardrum bursts). The pain tends to ease once the eardrum has burst due to the release of pus. Usually, the eardrum heals but middle ear infections can permanently damage the eardrum and cause deafness. Occasionally, tinnitus (noises), dizziness, or mastoiditis (inflammation of the mastoid bone around the ear) occurs. Middle ear infection may be indicated in babies who cry and are hot and irritable. As the inner ear is associated with both hearing and balance, infections tend to cause hearing loss, dizziness, a spinning feeling (vertigo), and loss of balance. Ear infections can occur in people of all ages, although they commonly occur in children. You are at greater risk if you get water, soap or shampoo in your ear such as when you wash or go swimming. Outer ear infections may more commonly occur in people with skin problems such as dermatitis, eczema, or psoriasis, and in those with narrow ear canals. Children with ‘glue ear’ (when the middle ear space becomes filled with a sticky fluid) are also more at risk of infection. Outer ear infections are usually caused by bacteria in the ear canal but can be the result of a fungus or yeast. Middle ear infections tend to occur when the air-filled space fills with fluid (mucus), which then becomes infected. Particularly when you have a cold, this can happen as the middle ear is connected by the Eustachian tube to the back of your throat. Inner ear infections are generally caused by viruses, e.g. the common cold virus, but sometimes by secondary bacterial infection. Ear infections may also arise for no apparent reason. Most ear infections generally resolve within 2–3 days and do not require treatment. However, if it persists beyond a few days, then you should contact your doctor. Pain can be treated with painkillers, such as paracetamol or ibuprofen (when treating a child read the instructions regarding age and dose). Painkillers can be taken before visiting your doctor, and will also reduce any fever. Antibiotics may be prescribed to treat ear infections and inflammation. They are especially used when the infection is severe and there is a high risk of complications. Antibiotics may be taken by mouth such as amoxicillin and cefaclor (if you are allergic to penicillin), or administered as ear drops or sprays, e.g. Gentisone, Locorten Vioform, and Otomize. Your doctor or nurse may also clean the ear canal to remove the discharge. How can I reduce the risk of ear infections? While infections cannot be prevented, the chances of getting one can be minimised. If you suffer from frequent ear infections then it is advisable to keep your ears dry. This means preventing water, soap and shampoo from running in the ear. Put Vaseline-covered cotton wool in your ear canal when you take a shower or wash your hair, and wear a cap or earplugs when swimming. Never leave anything in the ear that can prevent any discharge from coming out (it will make matters worse); you need only to wipe the discharge away with a clean tissue. Importantly, do not prod inside your ears. This includes cleaning your ear canal with cotton buds, which can scratch and push wax or debris down the canal. If you have an ear infection that has persisted for more than a few days, then we may be able to prescribe something for you. Sometimes a face to face consultation with your GP will be advisable however.